What if you could change your life without really changing your life? On the outside, Gretchen Rubin had it all - a good marriage, healthy children and a successful career - but she knew something was missing. Determined to end that nagging feeling, she set out on a year-long quest to learn how to better enjoy the life she already had. Each month, Gretchen pursued a different set of resolutions - go to sleep earlier, tackle a nagging task, bring people together, take time to be silly - along with dozens of other goals. She read everything from classical philosophy to cutting-edge scientific studies, from Winston Churchill to Oprah, developing her own definition of happiness and a plan for how to achieve it. She kept track of which resolutions worked and which didn't, sharing her stories and collecting those of others through her blog (created to fulfill one of March's resolutions). Bit by bit, she began to appreciate and amplify the happiness in her life. 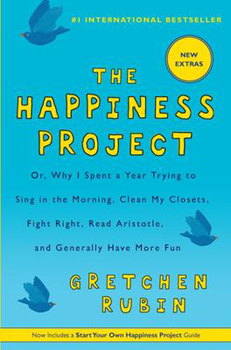 The Happiness Project is the engaging, relatable and inspiring result of the author's twelve-month adventure in becoming a happier person. Written with a wicked sense of humour and sharp insight, Gretchen Rubin's story will inspire readers to embrace the pleasure in their lives and remind them how to have fun.